The Twilight Time limited edition video label has just released its first 3-D Blu-ray, which just happens to be the first 3-D film released by a major studio right at the beginning of the big 3-Dimension craze that began with 1952′s Bwana Devil. The film is Man in the Dark (1953), a fast-paced mystery noir in which crook Edmond O’Brien undergoes a brain operation to ‘remove’ his criminal tendencies. As tends to happen in gimmicky sci-fi noirs (or Sci-fi pix of any kind), things go wrong. The crook wakes up minus any memory whatsoever of his past identity or criminal history — which makes him an easy target for his old gang. Noir icons Audrey Totter and Ted de Corsia respectively romance O’Brien and beat him senseless, in an effort to find out where he’s hid $130,000 in ill-gotten loot. But the secret only reveals itself through O’Brien’s weird dreams. I asked Bob Furmanek, President of the authoritative 3D Film Archive if his website would be covering this 3-D Blu-ray release. In answer, the 3D Film Archive’s Technical Director Greg Kintz offered to answer my less-than-expert questions. I’ve worked in pre-digital special effects and was a projectionist for Douglas Trumbull’s experimental Showscan format back in the late 1970s, but my exposure to 3-D isn’t that extensive. Here’s how Greg responded to my questions, and then followed up with some better questions of his own. Glenn Erickson: Hello Greg. 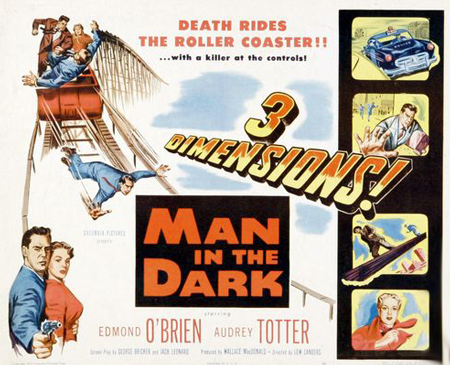 The liner notes on Twilight Time’s 3-D disc of Man in the Dark stress that unlike Warners’ House of Wax and Dial M for Murder, Columbia’s 3-D film was shot very quickly (just eleven days) with a custom rig engineered in its own camera department. I hear that 3-D at this time could be problematical, and that some of these rigs were difficult to work with. Were these cameramen really sharp, or lucky, or do 3-D experts like yourself see a few flaws showing through? Greg Kintz: The cameramen were extremely sharp. Most studios at that time had their own camera departments, which fostered originality and furthered pride in their work. Bob Furmanek has a number of correspondences from original 3-D shoots, and it is clear they cared about doing quality 3-D productions, despite what some of the recent press has tried to portray. With that said, unlike today’s digital 3-D gear where a tech can instantly check the stereoscopic alignment and/or make relatively quick adjustments in post-production, the 1950s 3-D was of course completely analog with no 100% guarantee that everything being shot was all aligned properly until it was screened later. Due to these factors, issues occasionally could and did occur. Some misalignments occasionally made it to final release prints. 3-D corrections were often done in post-production, but this required another generation loss and more time-consuming optical realignment. Glenn: On the much-ballyhooed roller coaster scenes, the actors are just photographed in front of a 2-D rear projection, which would seem a real cheat. Comments? Greg: For decades, this has been the biggest gripe folks have had with Man in the Dark. On one hand, in the context of the entire feature the roller coaster “POV” sequence is a relatively short part of the movie. I first saw this movie in 3-D some ten years ago knowing about the rear screen projection in advance, and ended up not being bothered at all by the timesaving technique. With that said, was it a missed opportunity? Oh, absolutely. It was interesting recently watching Man in the Dark with my wife who had been studying the 3-D Blu-ray artwork before seeing this for the first time. Afterwards she commented, “If the (original & new) artwork heavily plugs a roller coaster and 3-D, shouldn’t the roller coaster segment actually be in 3-D?” I couldn’t help but chuckle. But again… everyone’s tastes vary, and I still very much enjoy the overall story and shooting style. And in the end, they only had 11 days to shoot, so something had to give, and I guess it was the POV roller coaster segment. Glenn: I thought that the early trick 3-D shot in the brain operation scene was very well-judged, but one or two of the later stick-things-at-the-camera shots look like they were shot with long lenses — is the 3-D funky in these scenes? 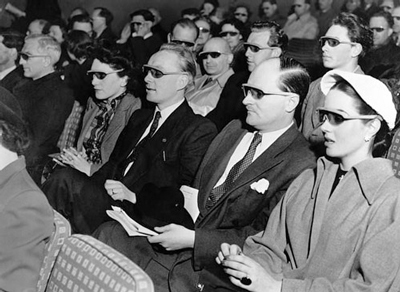 Greg: With the different resurgences of 3-D movies over roughly the last 100 years, there have been varying degrees of just how far one can shove something out of the stereo window — and to what degree audiences in general can handle those off-screen effects, from a 3-D eyestrain standpoint. Today’s movies are by far the most conservative in this aspect. Those of the 1980s typically were the most aggressive. The 1950s “Golden Age” 3-D titles for the most part were a balance between those two time periods and (IMHO) struck the best balance of the two. With that said, there are just a few thankfully very brief shots in Man in the Dark where if you look at the screen in 3-D, but with your glasses off, your eyes are being call upon to do some tough viewing. As you noted, the opening brain operation was well judged, as well as most of the other off-screen effects. 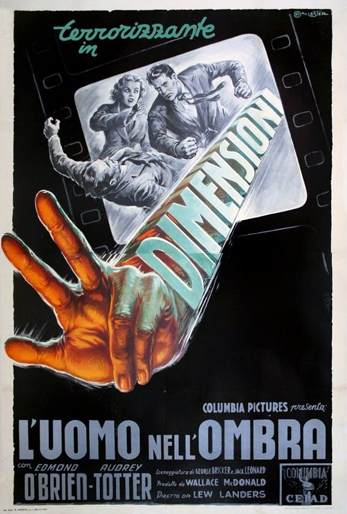 I think this was also one of the most aggressive 3-D movies of the 1950s in that respect. It was Columbia’s first 3-D title, so they were learning, and suppose they felt they had an obligation to “deliver the goods” so to speak, and present a good share of off-screen effects. Glenn: I would think that the most ‘aggressive’ Columbia 3-D picture of the decade had to be a Three Stooges short subject — everything got stabbed into our eyes in 1953′s Spooks! Did you see any particular issues with Sony’s 3-D Blu-ray of Man in the Dark? Greg: In the era of 1080p/3-D, and with most studio content being culled from the best archival elements possible, it’s quite easy to be spoiled. On the other hand, it is also easier to rightfully expect more things to be handled correctly. Overall, Sony did a great job. It is clear they have done some basic vertical realignment and further convergence to the original stereoscopic photography, which for the most part has helped. But like the recent 3-D HD restoration of The Mad Magician, Sony leaves any left/right size differential issues untouched, which still causes alignment issues and eyestrain. If you see vertical misalignment in the Man in the Dark, most of the time it is a L/R sizing issue that could have been corrected. Please don’t get me wrong — if you are a fan of noir and any type of 3-D fan, this is still a must- own and very enjoyable 3-D presentation. Could it have been better? Sure. Personally I think the best compliment that the 3D Film Archive has received was when we were grilling Warner Bros. on different alterations we had found in the House of Wax 3-D Blu-ray. WB’s head of restoration Ned Price actually thanked us for the critiques and said he prefers his team be kept on their toes. That’s a great mindset. Glenn: Didn’t most Golden Age 3-D movies have an intermission card, due to the required 35mm dual projection reel change? Greg: Yes! Man in the Dark was no exception and also had its own unique intermission card to be shown just before the required mid-show reel change. Sony has opted not to include the original card in this case. It’s possible it was not included in the original camera negative version, if that is the sole element they culled from. Glenn: I’ve noticed some 3-D movies have brief sections where the image goes flat .. as in 2-D. Why is that? Greg: The answer is a mix. Sometimes there were problems in the original photography. Even in the original release, these very brief segments or shots were instead shown as 2-D, or were slightly pushed behind the stereo window for a fake 3-D effect. Hondo and Revenge of the Creature are some of the best examples of when camera malfunctions required brief flat segments in the final 3-D release. Greg: Other cases can involve the loss of original elements on one side, but not the other. In the case of the Man in the Dark 3-D Blu-ray, I’ve seen both scenarios. There was one 2-D ‘flat’ shot that lasted roughly 40 seconds, but I am 99% sure it was 3-D on previous elements. I would pull some older elements to check if I only had more time. That shot is thankfully brief, and the few other very brief 2-D ‘single’ shots were that way in the original presentation. The 3-D Film Archive’s own comparison images of the left- and right- eye frames during Man in the Dark’s most squeamish 3-D effect. The reverse shot of villain Ted de Corsia’s lit cigar approaching Edmond O’Brien’s eye packs even more of a jolt.Glenn: Overall, would the 3-D Film Archive recommend this title, and are you guys planning an “in-Depth” review of this release? Greg: Quite frankly, we at the 3D Film Archive would have loved to have done a full review on this title, but at the moment we simply have our hands full. If all goes as planned, we should have three or more vintage 3-D Blu-ray titles out in 2014. I’d say more, but will leave announcements like that to 3D Film Archive President Bob Furmanek and the distributors. As for an overall verdict on Man in the Dark, we would absolutely recommend this title. The 3-D Blu-ray format has been in place for a while now, and it is a shame that so far this is only the fourth Golden Age title released. For a feature that was originally a rush job, Man in the Dark has a certain charm and certainly plenty of dynamic 3-D moments. To see this title in a high quality 1080p 3-D format even five years ago would have required some very expensive gear. Jump to present day and Twilight Time has delivered the goods. How can one say no? Glenn: They might say no, but 3-D devotees need to be reminded that the Twilight Time disc is a collector’s pressing limited to 3,00O units. So if you want to keep up with classic-era “Third Dimension” attractions, it’s probably not wise to wait too long. Thanks Greg, especially for coming through on such short notice — I didn’t see anybody discussing the realities of 3-D filming out in the trenches of low-budget Hollywood of the 1950s. 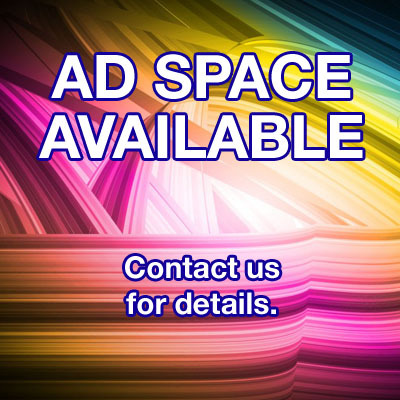 is available through Screen Archives Entertainment.